Approximately 40–50% of all colorectal patients relapse in the form of metastasis. In the last three years, several molecular classifications have been proposed to identify colorectal cancer patients at risk of relapse. In an article published online on February 23, 2015 in Nature Genetics, scientists headed by ICREA (Institutio Catalana de Recerca Estudis Avancats) researcher Dr. Eduard Batlle at the Institute for Research in Biomedicine in Barcelona (IRB Barcelona) explain why these classifications work and reveal, in fact, that they can be simplified and improved by looking exclusively at the genes that are expressed in the tissue around the tumor, known as the stroma or tumor microenvironment. “We have re-evaluated the classifications under our perspective and confirmed that colon cancer relapse occurs in patients in which tumor cells have the capacity to disrupt the tissue surrounding the tumor,” explains Dr. Batlle, Head of the Colorectal Cancer Laboratory at IRB Barcelona. The team of scientists examined the genetic profiles of approximately 1,000 tumors from patients all over the world. “The conclusion is indisputable. The key to the classifications lies in whether the stroma of the tumor is altered or not and it is this property that confers malignancy to colon tumors. Patients with unaltered stroma are essentially cured after surgery.” The Nature Genetics article is titled “Stromal Gene Expression Defines Poor-Prognosis Subtypes in Colorectal Cancer.” This new approach to addressing different types of colon tumor will soon have a practical application for doctors. On one hand, the scientists demonstrate that tumor cells communicate with the stroma through the hormone TGF-beta and that metastasis could be prevented in these patients by interfering with this communication. University of Toronto scientists have discovered how viral remnants helped shape control of our genes. If genes were lights on a string of DNA, the genome would appear as an endless flicker, as thousands of genes come on and off at any given time. Dr. Tim Hughes, a Professor at the University of Toronto's Donnelly Centre, has been focused on unraveling the rules behind this tightly orchestrated light-show, because, when it fails, disease can occur. Genes are switched on or off by proteins called transcription factors. These proteins bind to precise sites on the DNA that serve as guideposts, telling transcription factors that their target genes are nearby. In an article published online on February 18, 2015 in Nature Biotechnology, Dr. Hughes and his team describe the first systematic study of the largest group of human transcription factors, called C2H2-Zinc Finger (C2H2-ZF) transcription factors (image shows the general structure of these transcription factors). 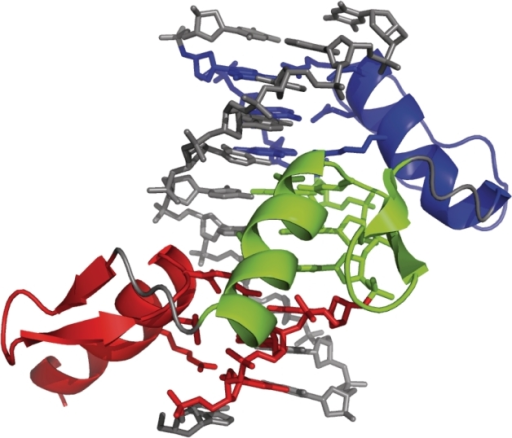 The Nature Biotechnology article is titled “C2H2 Zinc Finger Proteins Greatly Expand the Human Regulatory Lexicon.” Despite their important roles in development and disease, these proteins have remained largely uninvestigated because they posed a formidable challenge to researchers. C2H2-ZF transcription factors constitute a group of over 700 proteins, approximately 3 per cent of all human genes. To make matters more complicated, most human C2H2-ZF transcription factors are very different from C2H2-ZF transcription factors in other organisms, such as those in mice, for example. This means that scientists can not apply insights gained from animal studies to human C2H2-ZFs. In their new work, Dr.